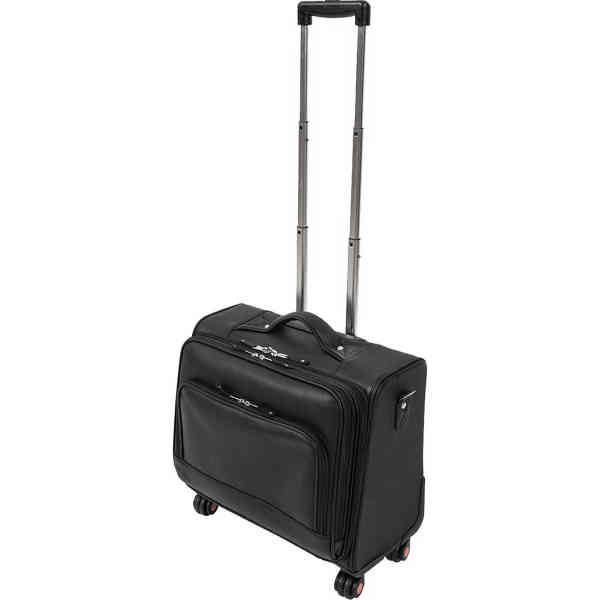 This Carlin Canyon wheeled briefcase/overnight is perfect for the traveling business person! The main compartment has a two-way zipper with an interior clothes holder and quick release buckle. The telescoping handle extends to 23" and the 360-degree spinner wheels allow for effortless maneuvering. The front pockets have multiple slots for a phone, pens and business cards and a snap-out metal key clip. The 15" W x 11" H x 1 1/2" D laptop sleeve has a removable padded zippered case. There's a sturdy handle or padded shoulder strap for carrying. The strap adjusts from 35" to 48" for the perfect fit. The bag comes with quality YKK zippers. The back side has an ID holder as well as two zipper openings for a rear trolley strap that can be attached to other rolling luggage. Size: 18 " x 17 " x 10 "